2008 Topps NFL Football - Complete Factory Set Trading Cards. This factory sealed NFL Football set contains 440 cards, featuring top NFL veteran players including Manning, Tomlinson, Brady, Urlacher and 110 rookies appearing for the first time in a Topps set. Plus 5 rookie cards that are exclusive to the set. 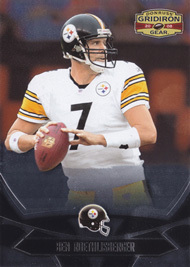 2008 Ben Roethlisberger - Pittsburgh Steelers / Gridiron Gear NFL Football Trading Card, by Donruss.